By Liz Hessen on July 5, 2013 Visit Liz's Website. We’ve only had chickens while living in the city so I have no actual experience with raising them in the country except what I’ve garnered from those who do. I can give you our experiences and my educated guess at comparisons! Our chicks were delivered by USPS when they were a day old. We’ve never had the experience of watching chicks hatch. Ours were kept in a brooder till they were old enough to go out. We were mama to them. I hope one day we will be able to let one of ours hens sit on eggs, hatch them and watch her be their mama! We don’t have acres and acres of farm land or open land for ours to spend the day running around, foraging on. 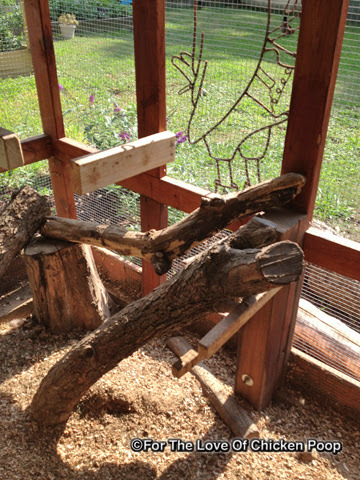 But they do have a nice, enclosed, secure run and coop. The major predators for them (in this area) are hawks in the daytime and raccoons at night…no foxes, coyotes, etc around here. But they still get a lot SUPERVISED free range time. Because they’re not out running free, playing and foraging for food all day we put lots of fun stuff – stumps, limbs, wooden perches – in the run to use like a jungle gym. Nutritional needs are also a concern when they don’t get out to forage very much. They already get the best chicken feed that meets there needs. Their treats are healthy! We take into consideration things such as molting, the weather, any egg issues. Picked out their own decor. 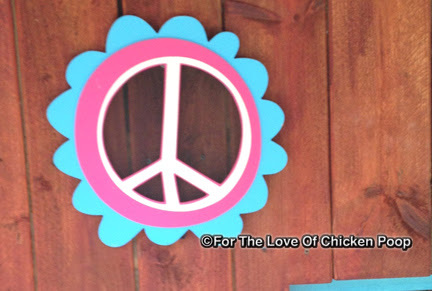 Our city chicks have their run decorated with a big peace symbol , Jimmy Buffet stickers and a four foot tall antique wire sculpture of the Old Crow – (as in whiskey). 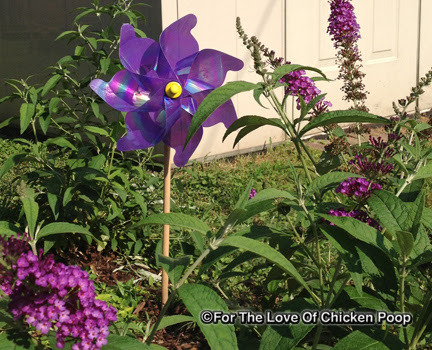 A few chicken related decorations are around the outside of the run including butterfly bushes and fun pin wheels. 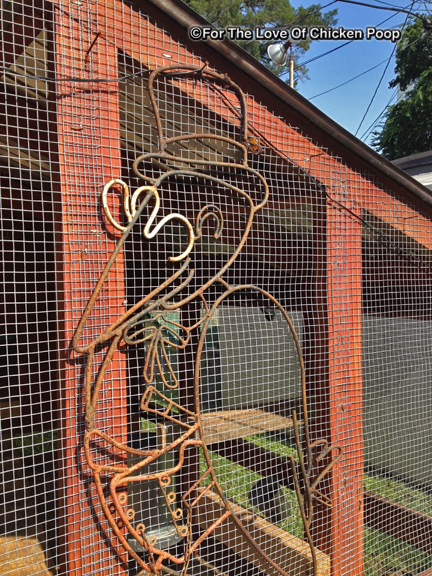 I put pin wheels in my garden also and amazingly it keeps them out.The closest thing we have to a rooster is a wooden, carved one that sits in the kitchen window silently keeping watch. Old Crow on the outside. 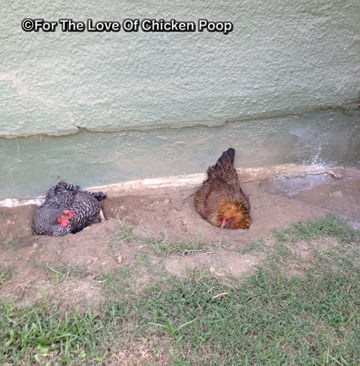 Most all city chicks and country chicks love their dust baths. Ours have dug theirs to stretch from under the back porch where it’s very cool to a length of about six feet against the house. They have a choice of sun or shade! They worked hard on it to meet their standards. They love their spa time, like any other chicken, but when ours are finished they always come and stand on the patio to shake off – like they’re saying‘Hey, look what I did’! Or if one of us is in the vicinity they will get as close as they can and then shake off on us. Do country chicks have a fancy flourish at the end of their dust bathing? ‘Audrer dear, you’ll never guess what I overheard Carmen say in the nest box earlier’! Dogs and humans are the only animals our city chicks have to play with. I’m sure they would love to have horses, cows and goats in the mix but this is the city and that will never happen. I have read about natural symbiosis between all animals on a farm and how important it is. I guess, for our city chicks, we play the rolls of the other farm animals! I’ve been practicing my oink, baah, mooooo and neigh but the chicks say I have a long way to go before they will be seriously impressed. They are beginning to comment on how life-like my crowing has become, though! Our city chicks try to follow us in the back door. They don’t get far but they NEVER give up trying to join us in the kitchen for coffee! That would probably be a no-no for most chickens no matter where they lived -except under special circumstances like illness or injuries. ‘What is this? I’ll just check it out’! I spend time turning over logs and stones for them to forage under. Harry is always digging up the ground so they get tons of insects. 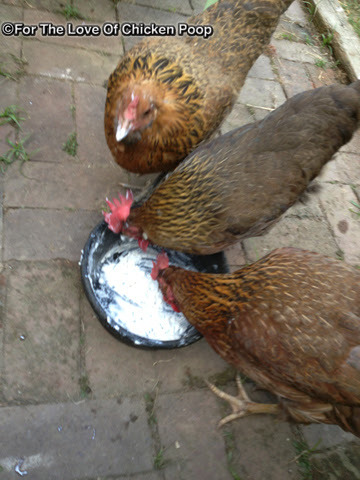 The country chicks, I would imagine, nee no extra help with their insect foraging! What kind of chickens are these? I have one that looks like your one on the bottom but don’t know the breed. I picked up a container of non-fat plain yogurt recently and my husband asked what it was for (in other words: yuck). “For the chickens!” Oh the face he made, because he realized they are as spoiled as the horse I had (and I bet they end up costing as much, lol). Of course I also made some Ranch dressing with it, but still. 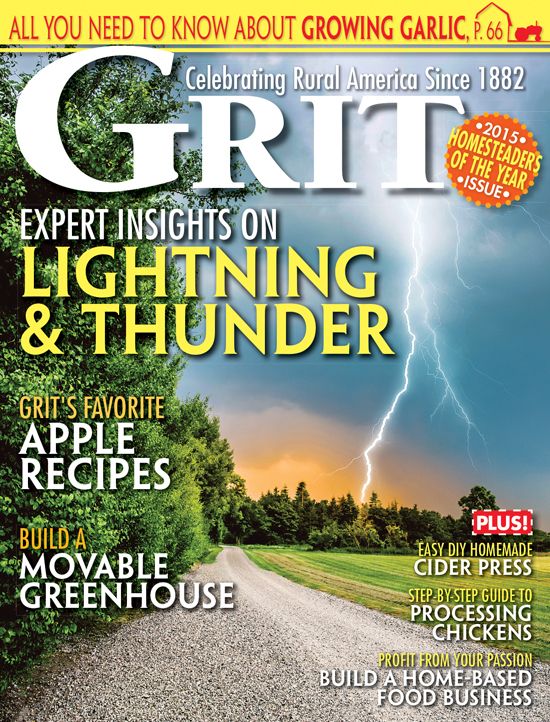 We are out in the country, so I can answer for mine- they get all kinds of rocks and wood overturned for them, even shovel-fuls of dirt… but very few things ever show up here in the drought. 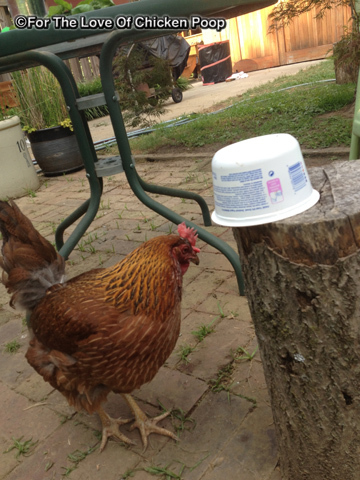 I have one pullet who is tamed, and she rides the shovel and digs whatever is unearthed. Because she gets first dibs of any leftovers (being first at my feet) the older hens have learned to shadow her, and she’s learned to be quick as a bullet to grab and go! I had never heard of the farmyard symbiosis, but I’ve seen photos of goats atop of laying horses, and chickens roosting on top of sheep. What great photo opps! Good luck with your city girls! Thanks llloura! We have a couple of ‘shovel-riders’ also, lol! Ours don’t realize how easy they could lose a toe…or worse. If we do serious digging we have to put them in the run for their own safety !